Taxes! Who in their right mind ever wants to pay them? Or who would ever donate extra to the national debt, which is an option on the tax form? We are everyday average citizens with a few dollars in our savings accounts. Yet, a billionaire in California just bought the biggest life insurance policy ever for $ 201 million. Right now you are saying the same I am: “Argh! Insurance companies! They sleep with the devil and the IRS!” Yes, insurance industry has a bad reputation on pickpocketing our hard earned dollars. But is that stereotype correct? This mystery billionaire in Silicon Valley is teaching us a great lesson on preserving our wealth for our wife and kids. How so? His kids that inherit his $ 201 million life insurance policy will be exempt from paying the crazy inheritance taxes. The inheritance taxes are now a whopping 50 %, depending on how much wealth you have accumulated. With President Obama going on these shopping sprees with your money, expect the death tax to go even higher. I hear rumors of 65 % tax coming in 2014. I would not doubt it. Why such a large policy? Because inflation in the next 20 to 30 years is the real killer of your investments. Inflation is the secret tax that the Federal Government does not want anyone to know about. The only problem with a large insurance policy is the higher premiums when you get older. For a million dollar policy, do expect to pay a good $ 20,000 a year for the policy when you come close to the average age of death according to actuarial tables. $ 20,000? “How will I pay that?”, you are thinking to yourself right now. You will find ways of budgeting and savings that will make you pay for that. This is investing in the welfare of your wife and children. Do you want your wife being 70 years old and being a cashier at Target or Kohls to make enough for food a month? Or would you rather have your wife live worry-free on financial security? Thanks to pharmaceutical sciences, we are now living to the 90+ years of age today. One needs to think about the financial security for 20+ years after the husband dies. It is your job as a father and a husband to supply your family with a college education and a financial security of old age. Do you want to be 72 years old and restocking paint and screwdrivers in your local Home Depot? Or would you rather be at ease of counting all your pennies and living on food stamps? It is up to you…… No! I said that wrong. It is your responsibility as a husband, father, and earning the title MAN OF THE HOUSE. Be responsible! Envision the future… your family’s future. Are you asking what is so special about these years? 2007 is obvious because it was the start of the mortgage crisis with Freddie Mac and Fannie Mae. 2008 was the year of catastrophe with corporations pocketing “easy money” from TARP. This was the caffeine rush of Bush’ spending spree since 9/11. And we are still in the spiral of overspending 7 years later with Obama in office. In 2011, this is before the 20 percent or more decline in stock values. After the major decline, stocks went riding a huge tidal wave of increased stock prices. When stock market goes down, we all know we should head to Treasuries. But, what about investing in bullion and paper gold? Goldman Sachs stated that gold is expected to be around $ 1,050 an ounce by end of the year. This is over $ 150 below the cost of mining the shiny metal. Why should we dig it when it is costing us more than its market worth? Everyday ordinary citizens are up for a big surprise when Goldman Sachs, Societe General, and other investment banks force the price of gold to go down. Then the little people will be selling their gold and common stocks because both are heading down. This is not intellect; it is just plain fear. emotions is how you lose money on Wall Street. believe me, it has happened to me a few times in derivatives trading. When you get excitement and emotional, SIT ON YOUR HANDS! How to make money in the bear market? Invest on the downtrend, instead of your usual looking at the uptrend. There are not just bulls; there are also bears. Both make money while the pigs get slaughtered and the sheep get fleeced. Stop following everyone like a sheep and start doing your homework. Everything in life takes hard work to make it successful. Keep learning and asking questions. Why Give Financial Advisers And Fund Managers Your Money? A lot of times in New York City I am just bored on Saturday. I hate spending so much money on Lincoln Center operas and Off Broadway shows just to fill my gap of boredom. Instead of spending money, I always enjoy window shopping for stuff I can not afford anyways. So, I walk up Madison Avenue to Barneys and do my window shopping. The rule in the upscale department store is: if you ask how much, you can not afford it. So, I go looking and browsing at 3,000 dollar suits and 10,000 dollars and up in watches and jewelry. I always see the personal shoppers busy with clients wearing fur coats, Gucci sunglasses, and carrying there little poodle that is so small I can mistake for a Coney Island Nathan’s hotdog. The upper class woman gives the American Express card and charges her $ 10,000 purchase to it. So, I sit and I am wondering if the woman is ever going to wear her 4 new dresses. Does she even like the color? Or does she just a shopaholic that just loves spending money? I never understood why a person would rely on a total stranger to do the shopping for them. I prefer the experience of trying the clothes on and the adventure of the shopping fun. Then it pondered on me when standing on the 6th floor waiting to go down. Like a lightning flash in the dark sky, I got the idea that all Americans in all three classes use these “personal shoppers” all the time and they do not even know it. No, not all Americans wear $ 4,000 dresses and suits. But, they all do invest in pensions regardless of their careers or standard of living. Just about everyone today has a 401 k or traditional IRA. We go to the bank and speak to our financial advisers so they can open a pension for us. We rely on their wisdom to find the best place to invest our money. But, we as everyday Americans can not ponder the thought that financial professionals are only interested in getting management fees from over hard earned dollars to pay for their new Aston Martin or month long vacation on Lake Como in Italy. All one has to do is open a few books and see all there is to investing. If you enjoy throwing money to total strangers and believe they can invest best for you, then enjoy being robbed LEGALLY. If you just opened your eyes to the theft all over today, then you can make a few changes and be your own boss. So, what does one do with their hard earned money? Wake Up! Control your own destiny! If you rely on LEGAL THIEVES to make you rich, you will not ever be rich. You will always be the same as you are now. The professionals get rich while you lose your one time opportunity to take a month long vacation with your loved ones in Summer. The internet is your one source for guidance and advice. Do your homework or else you get a BIG F on the final exam. Be smart and invest wisely; then you can retire 10 years or more early. Shopping Malls: Will They Exist in 2020? Easter is an American quintessential family holiday. We started Ash Wednesday for the beginning of Lent. This is a quite important holiday for me as an American Jew. Not in a religious sense per se. Instead, it is the starting point of Spring Cleaning for the upcoming eight days of Passover. To celebrate the misery of no bread for a week, one has to clean their house up until there is not one crumb of anything leavened in their house. But, both holidays have one thing in mind: bring family back into what is supposed to be the American family like we see on The Brady Bunch. While the American family values get rebuilt from its slow and painful death from the 1960′s, there is an even bigger slow and painful death since then: Shopping Malls. 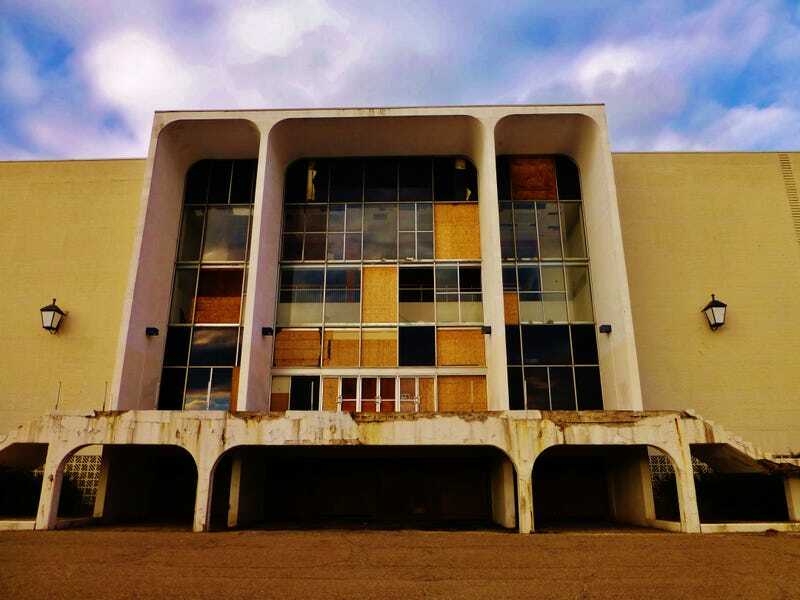 Just like the family values of today, the shopping mall is suffering a long, long death. the industry took the MRI examination and it was confirmed they have an incurable Online Shopping Disease (OSD). Renowned hedge fund manager Bill Ackman helped save mall real estate investment trust General Growth Properties (GGP) from bankruptcy in 2009 . He turned $60 million into $1.6 billion in those 5 years of crisis in real estate. But, Bloomberg reported last week that Ackman sold his final 28 million shares back to GGP via a buyback for $556 million. It looks like Ackman is taking his money and running from mall real estate. A good example is his loss of hope on JCPenney’s, one of the many dying retail companies. Sears, Macy’s, Radio Shack, and Kmart are a few of the next followers of Border’s, Caldor, and Woolworth’s. Shopping malls have risen to the peak of their capacity in all three ways. They would lose tenants or lose capital assets. When you are at the top of Mount Hood, there is only one way to go: STRAIGHT DOWN! The picture above was the Canton Center Mall in Canton, Ohio. It gives a vision of what 2020 would look like when Cyber Monday puts Black Friday out of business. So, where do we put our hard earned savings for investing? There exist very few Walmart, Kohl’s, TJ Maxx, or Target stores in malls. These big four retailers have a long way to compete with the online shopping revolution. They all have been vaccinated from OSD because they do a lot of online shopping services. I still prefer shopping at your local small retailer in my neighborhood. Yet, the convenience of these four retailers is amazing because they ship the product free of charge to the store of my designation the next day. Your local store would be a wait of up to a week to order a product because their inventory operations is on a much smaller scale. Retail is not dead. Instead, it is transforming to keep up with our fast paced life. Make sure your investing ideas are also transforming with the new wave of shopping services. When companies grow, so do your dividends every 3 months. Last Sunday was an all day spent with me nephew. We went off to the New Jersey Aquarium to see the otters, whales, and seals. Afterwards, we went to the Waterfront to play in the park and eat ice cream on a chilly weekend. Have you ever noticed that kids get so messy playing in the mud with all the dirt and mud? They surely have no care in the world with playing in the dirt. It should bring back memories of your childhood. Yet, kids are much smarter than you think. They love dirt, sand, and soil. That is basically all they do: play with dirt. Well, all of us as grownups can also do the same and make out like a bandit from investing. Yes, you heard me right: investing in dirt. One of the most overlooked investments today is potash, better known as fertilizer. Both graphs below are two of the largest corporations. Plus they are two of the most hated companies by Wall Street because of that deep dive you see we had last August on the industry. Looking at both companies, they were poorly performing last year compared to the S and P 500. In both companies, I put in 3 percent of my own portfolio each. This is the secret to diversification: do not put all your eggs in one basket. The same with dollars: do not put all your dollars in one investment. People are generally interested in High Technology, Big Pharma, or Banking as their key industries to focus on for investing. I strongly believe that diversification is the key to successful portfolio management. A diversified investor is one who hedges against the trying to beat Wall Street. Instead of gambling, invest by going with the flow and use Wall Street for your advantages. Do your homework and you will get an A+ in diversified investing. Unknown to many mainstream investors, tellurium (te-LOOR-ee-um) is a metal of rapidly-growing importance. While technically a metalloid in elemental form, tellurium’s role as a semiconductor has made its use in solar panels highly valuable with the expansion of solar power since 2008. From its less-than-humble beginnings as a metal alloy used to increase steel and copper’s machining characteristics (it was used in the construction of the outer shell of the first atom bomb), tellurium’s role in thermoelectric applications and its ability to produce some of the highest efficiencies for electric power generation have pushed the element into resource market spotlights in recent years. When alloyed with a number of other elements, such as cadmium, mercury, bismuth, and zinc, tellurium forms a telluride compound that enhances a material’s ability to conduct electricity; this ability is enhanced when also exposed to light. For that reason, tellurium, and cadmium telluride (CdTe) in particular, has become increasingly sought after as a source of thin-film photovoltaic solar panels since First Solar (NASDAQ:FSLR) proved the compound’s economic viability when it began mass commercial production of CdTe solar panels. As a measure of its growing importance, tellurium prices in 2000 were around US $14/lb for 99.5 percent purity. Since 2009, the price of tellurium almost tripled from US $130/kg to around $400/kg in 2011. Prices have come down since the latter half of 2011, and are now trading at a high of $170/kg. Currently only a small handful of companies are engaged in producing tellurium. British Columbia exploration and development company, Deer Horn Metals Inc. (TSXV:DHM) is one of the newest companies focused on bringing tellurium to market. Interest in diamond investing is on the rise, but many investors still have questions about the best way to get involved. After all, choosing a diamond company to invest in can be difficult, as can figuring out if a physical stone is a good investment. InvestDiamond.com, which was launched last year by gold and silver trading platform LinGOLD.com, believes that it has the solution to those — and other — problems. The company describes itself as “the only online platform that allows members to trade in diamond fractions rather than entire stones,” and is aimed at making diamond trading easy and affordable. To find out more about what InvestDiamond.com offers, Diamond Investing News (DIN) spoke with Linnea Bruce, project manager at the company. In the interview below, she explains how the website works and who it is aimed at. In closing, she gives her outlook on where diamond prices are headed in the short and long term. DIN: Starting off with an easy question, what is InvestDiamond.com and what inspired LinGOLD.com to create it? LB: The concept behind InvestDiamond.com is that there are batches of diamonds that have specific characteristics, and members become co-owners of these batches — they can buy fractions as small as 0.001 carats, which means investing can start at US$15. The idea is to bring diamond investment to everyone. LinGOLD.com is a gold and silver trading platform, and they were looking for a way to further diversify with tangible assets. They researched, doing market studies and looking at the Bain reports, and diamonds seemed like the next logical step for a new project. DIN: Can you tell me more about the fraction trading system that InvestDiamond.com uses? It sounds pretty unusual. LB: It is. As mentioned, members can buy fractions as small as 0.001 carats; on the website there’s a trading panel, so they can decide how many millicarats they want to buy and also put in their price. The price that’s there by default is a price quotation from the website, and it’s calculated via a mix of supply and demand on the website, and also with respect to the Rapaport price. The Rapaport price that we use is for a 1-carat diamond, E color, VVS1. If we see that the price on the website is starting to become a speculative bubble, or is getting too far away from the Rapaport price, then we inject diamonds into the system at a reasonable price to bring the price quotation down to near the Rapaport price. Members can also sell their fractions using the same trading panel — they put in the number they want to sell, or they can put in their own price. If they are above the quotation price, that’s fine, it just means they may need to wait a little while to find someone to buy at that price. DIN: Normally diamonds are valued subjectively (ie. there’s no simple cost-per-ounce valuation system), which can make some people hesitant to invest. Does using batches address that concern? LB: Yes. We decided to have batches of several different types of quality — we’ve chosen to have investment-grade diamonds, but not all stones of 1 carat, D color, internally flawless, which are really rare and could create a speculative bubble effect. That allows us to show what an average InvestDiamond.com carat would look like and come up with an average price. DIN: And reselling diamonds is fairly easy? I know that can also be a big concern for people interested in investing in diamonds. LB: It’s definitely easy to resell because the diamonds are stored in Switzerland in a free port zone. That means members don’t have to pay the value-added tax (VAT). As a result, it’s easier to resell and make a profit on reselling. And, as there are many other members buying at the same time, members always have a buyer ready as they’re selling. DIN: Okay, so the diamonds held by your clients are actually physical products. Where do you source those diamonds from? And what kind of diamonds are they? LB: We have a supplier located in Antwerp. They actually cut the rough diamonds, and all the diamonds they receive come from countries that respect the Kimberley Process — they’re not conflict diamonds. Those diamonds are between 0.5 and 2 carats, and they’re between internally flawless and VVS2. They’re between D, E and F and they’re all colorless. DIN: Would a client be able to take possession of their diamonds if they wanted, or does that not work with the fraction system? LB: They can’t take a diamond out of its batch, but if they’ve invested in the site, what they can do is sell those fractions and then buy a diamond from our supplier. However, if they do that, then they have to pay the VAT tax and it’s less of an investment. In France, at least, it’s 20 percent, and getting that back would be pretty difficult. DIN: Do people often choose to buy in that way? LB: No, not really. We get requests sometimes, but people who do that are generally doing it for jewelry purposes, more for pleasure than for investment. DIN: Who is InvestDiamond.com aimed at? Can someone who’s new to the diamond space get involved, or is it for more experienced investors? LB: It’s actually for both. Since the trading panel for buying and selling is pretty simple, you don’t have to be an experienced trader to understand how it works. We also have a 40-page guide with lots of information to educate people, and the FAQs on our help page explain a lot about diamonds — where they come from, what criteria there are, things like that. At the same time, we of course welcome people who are experts in diamonds. Right now we’re developing an expert mode so clients can place different kinds of orders — they’ll be able to pass more complicated orders and decide what the expiration date is, or what prices they want to buy between. DIN: Have you seen a lot of investor interest thus far? LB: We launched in France in November, and since then we’ve had somewhere around 750 members. Our English site just went up a couple of weeks ago, so I don’t have stats on that one. But yes, we’ve had a good deal of interest. DIN: Finally, what’s your 2014 price outlook for diamonds? LB: Our outlook for 2014 is that diamond prices will be relatively stable. Looking farther than a year, we think diamond prices will increase because they’re becoming more rare — even though there are new mines opening, there haven’t been many discoveries of new deposits. Also, demand is increasing, especially in China and India. Solar Energy: Is It For Wealth Or Gone Bust? We all know what is shale gas. We see Bakken reserves in North Dakota and many other reserves in Pennsylvania, Ohio, and Texas. Back in 1970′s it sounds science fiction that we get energy from solar heat called sun gas. Yet, researchers claim that natural gas power plant efficiency can be as high as 25 %. Solar ThermoChemical, LLC has coughed up a good $ 850,000 to do research in hopes of commercializing sun gas very soon. This is great technology. But, the graph above comes from the US Environmental Protection Agency. The question is how much good it sun gas when many places have moderate or below moderate sun exposure the whole year. While it would be great technology for New Orleans, how would it be for Alaska or Manitoba? Is solar energy a dead idea on Wall Street? We can look at General Electric as an example. 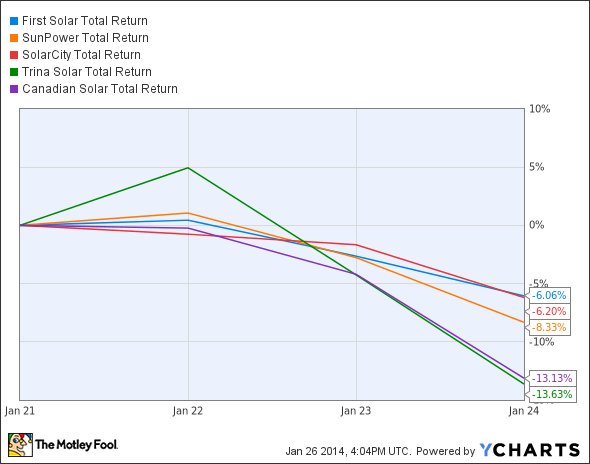 We see how solar energy stocks have started out the new year. People have thought of it as a hated stock with no confidence from Wall Street. These are two of the three keys to invest in a hated industry. It is missing one more; it needs to start an uptrend. When the uptrend is in motion, then all contrarian investors can make a bang with their bucks. The ideas we back off, China takes and turns it into a new age technology. I see a great opportunity in investing in solar energy in the long run. For a quick buck, go to Atlantic City and see if you can win. For growing your wealth, look at long term. With solar at the bottom, it can only go up from here. When an uptrend comes in, look for opportunities. The United States has one of the largest militias in the world today. About 540,000 troops to be a good estimate. In order to keep within budgets, we are cutting the military to 440,000. This 16 % cut in the military would be decreasing the forces into the pre-WWII size we were. 108,000 of our troops are in one particular state: Hawaii. Think about cutting the military a good 20 % in Hawaii. This will make the United States very vulnerable to our not so good friends in Asia Pacific. Since we will cut in Hawaii, I am foreseeing cuts also in our second most important trade partner (Canada being the first): Japan. In Okinawa, Japan, we have some 50,000 soldiers. Reuters made a good point on what is the “real strategy” of lessening our forces. We are not decreasing our military at all. 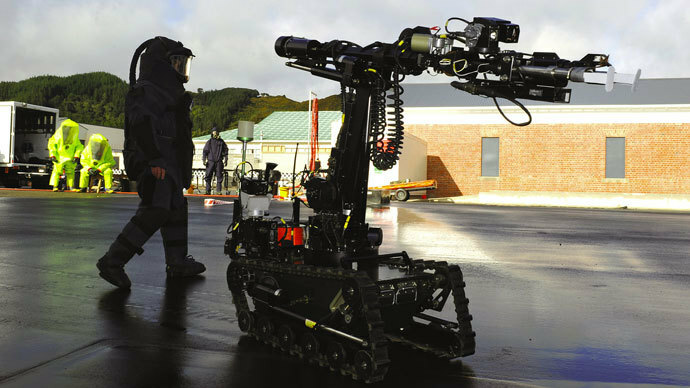 With China ready to rage war with Japan on the Senkaku Islands (huge oil deposits) in the East China Sea, it would not make sense for us to back out and take our military away. In Spring 2014, The US will deploy drones to observe the East China Sea. We are not decreasing our military; we are increasing it (just with drones instead of humans). The picture above is the NEW MILITARY! Machines do not need a Whopper for breakfast. They do not require 8 hours of sleep per night. And they do not take off for Easter, Thanksgiving, or Christmas. They work 24/7. And most important: they do not require any pensions, insurance, or any other benefits. Is this science fiction really becoming science? I am afraid so. In 2006 I did my MBA Studies at Fudan University in Shanghai (The Wharton School Of Business of China). I went to eat with my fellow classmates and I had a science fiction moment. I had a robot on a conveyer belt going around the middle of the restaurant to each table it was signaled to. I had to type (thankfully in english) into the computer my Philly-Style cheese steak order. It was mind boggling to me that a human being is not the waiter or waitress. This is the future… now the present. The classic movie The Terminator is one of my favorite movies to watch in science fiction. By the year 2020, Netflix will have to move it from Science Fiction to Documentary. What was fiction in the 1980′s is starting to become true today. If you remember the movie franchise, SkyNet (the military computer system) had artificial intelligence. It was so intelligent that it took over its own control and the world was doomed to be destroyed. It is up to you for preparations for the upcoming economic turmoil for 6 billion people one day. To Your Health… To Your Wealth… To Your Wisdom.